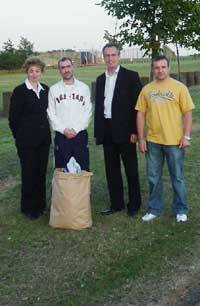 Ardoyne republican Seán Kelly was release from Magahberry jail on Wednesday night, 27 July. Sinn Féin Assembly member for North Belfast Gerry Kelly and party colleague Councillor Caral Ni Chuilin met Kelly on his release. Gerry Kelly said: "Seán Kelly should never have been arrested in the first place. "It would be my wish that the Sentence Review Commission resolve this situation as a matter of urgency and allow Seán and his family to get on with their lives." The latest dramatic development comes as the campaign to have Seán Kelly released for good has gained momentum on the streets. There was a large demonstration at Dundonald House, East Belfast on Friday 22 July. Campaigners targeted the headquarters of the Northern Ireland Prison Service (right), after it was revealed it played a role in Kelly's re-arrest. Addressing the demonstration, which saw Dundonald House closed down, Sinn Féin North Belfast MLA Kathy Stanton said: "At a recent meeting of the Policing Board the PSNI attempted to distance themselves from the internment of Seán Kelly. They indicated the involvement of the Prison Service in this unjustifiable act. "Was the Prison Service involved?" asked Stanton, "if so why? We are demanding answers to those questions". The SDLP has come under fire from Free Seán Kelly campaigners after its refusal, on Thursday 21 July, to back a Sinn Féin motion tabled at Derry City Council calling for Kelly's release. Opposing the motion SDLP Council leader Pat Ramsey said British Direct Ruler Peter Hain, should release Kelly again under license if there is nothing to justify his detention. The SDLP refusal to support the call for Kelly's immediate release, was described as, "an act of political cowardice", by Sinn Féin's Raymond McCartney. "Pat Ramsey is more comfortable in calling on the British Secretary of State to prove Seán Kelly did something wrong rather than call for his release". The previous day, Thursday 21 July, campaigners in the Lagan Valley area on the outskirts of West Belfast organised a day of events. At the Dairy Farm Shopping Centre the local Free Seán Kelly Campaign, in conjunction with Coiste na n-Iarchimí, held an anti-internment exhibition in which they drew the comparison between the internment of hundreds of republicans in the 1970s and the imprisonment without trial of Seán Kelly. During the two hours that the exhibition was running dozens of shoppers signed a petition calling for Kelly's release while activists handed out leaflets outlining the details of Kelly's false arrest. Speaking to An Phoblacht Sinn Féin Councillor Veronica Willis said: "In the 1970s men and women from all over the North were being interned. Today, over 30 years on, the same thing is happening to Seán Kelly. Sinn Féin and the Lagan Valley POWs demand his immediate release." During rush hour, a white-line picket was held on the busy Stewartstown Road. Sinn Féin's Michael Ferguson urged republicans across Ireland to hold local protests as it, "allows local people to express their anger and disgust at the internment without trial of Seán Kelly". Later that night a public meeting was held in the Beckett's Entertainment Complex in Twinbrook. Former internees Davy Hall and Angela Nelson addressed the audience and spoke of their experiences of being held without trial and without the chance to examine the accusations that were levelled by RUC Special Branch against detainees. Seán Kelly's partner Geraldine and his mother Ann attended the meeting. Meanwhile in Derry on Friday 22 July the Belfast man's partner and their three children Shannon, Clíodhna and Seán attended the unveiling of a mural on the Free Derry Wall (left). Derry campaigners launched a Green Ribbon appeal and asked people to wear the ribbon in support of the calls for Kelly's immediate release.